This exercise increases thoracic spine mobility in spinal flexion and spinal extension. 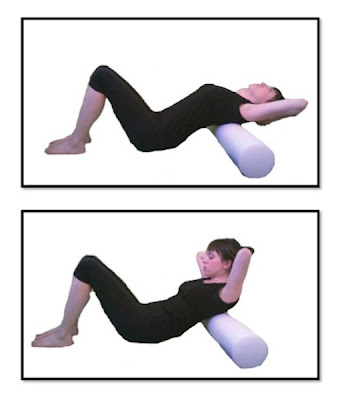 It provides the body the opportunity to improve posture while releasing shoulder and neck tension. This exercise should not be done if you have Osteoporosis. As you are releasing your head, neck, and shoulders to the ground be sure that you are opening your chest and widening your collar bones. This is a great way to begin to improve posture around the head and shoulders. Be sure that the foam roller is at the bottom of the shoulder blades and not lower on the spine. If the foam roller is too low you might feel discomfort or even strain in the low spine.